International Series of Monographs in Analytical Chemistry, Volume 39: The Destruction of Organic Matter focuses on the identification of trace elements in organic compounds. The monograph first offers information on the processes involved in the determination of trace elements in organic matters, as well as the methods not involving complete destruction of these elements. The text surveys the sources of errors in the processes responsible in pinpointing elements in organic compounds. These processes include sampling, disruption of the samples, manipulation, and measurements. The book examines the processes of wet and dry oxidation, including their applications to sulfuric, nitric, and perchloric acids and hydrogen peroxide. The methods of dry ashing and oxidation with excited oxygen and oxidative fusion are elaborated. The text also underscores the varying methods in removing trace elements in organic compounds. The elements include zinc, copper, silver, gold, lead, germanium, titanium, arsenic, bismuth, and vanadium. The book also describes wet digestion methods and dry ashing procedures in the removal of trace elements in organic matters. 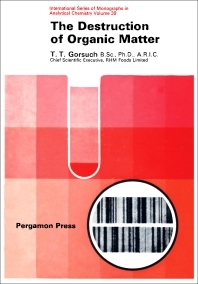 The monograph is a vital source of information for readers interested in the identification of trace elements in organic compounds.